Why I read this book: Seemed like a good idea at the time. The Professor and the Madman tells the historical stories of two drastically different men in mid-to-late Victorian England (though neither was English) who came into contact with each other through their painstaking collaboration on the compilation of the Oxford English Dictionary. 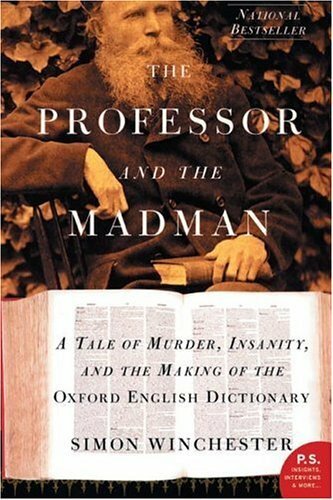 The book also attempts to follow the separate threads of their lives, before, after and during the period of their long-distance acquaintance - The "Professor" James Murray is followed in his trajectory from poverty in Scotland to eventually undertaking the monumental task of editing the most ambitious dictionary until then; and the "Madman" William Chester Minor, a well-born American Yale medical school graduate and Civil War veteran committed to a mental asylum in suburban Berkshire, who found purpose in life through volunteering his time in submitting thousands of references for the dictionary in question. I must admit to not being as intrigued by this book as I'd expected to be. I'd somehow bamboozled myself into anticipating a more in-depth study of the creation of the OED. However, as I've mentioned, the main focus of the books was actually on the biographies of these two historical personalities. In fact, I believe most of the book consisted of the biography of W.C. Minor - that is to say, a fair bit of it delved into such tangential topics as snapshots from the Civil War. Not a boring subject, certainly, but honestly not quite what I was looking for. Additionally, I'd also been hoping for a more formal narrative, since I've suddenly developed an inexplicable craving for non-fiction written in a fairly academic style. This book, however, read like a non-fiction novel. Again, nothing wrong with that, per se - just not what I was looking for. That said, the writer's occasional predilection for crowbarring in some of his own speculations I found off-puttingly unprofessional. I can't describe exactly what I mean without giving parts of the story away - let it suffice to say that there are less heavy-handed methods of upping a book's salaciousness quotient than making unfounded allegations. To be fair, though, I can't really gauge for certain the basis behind any claim whatsoever made by Winchester, as I found the volume utterly bereft of references. Beyond a quick mention in the introduction of being privy to certain official documents that had not otherwise been made available to the general public, there really was no way to ascertain the authenticity of any of the statements laid out to me. Perfectly fine if the writer's intent is for the book to be taken as merely an interesting story, but I must say that its validity suffers as a result. I give this book 3 stars, thought I acknowledge the blatant subjectivity of my belief in its mediocrity. Perhaps if you went into it knowing what to expect, you'll enjoy it much more than I did. I have to say that this book sounds intriguing even though you didn't care for it as much. I just finished this book, myself. I agree with your assessment: I was expecting a much better book. The only parts I really got into were the details concerning the actual creation of the OED. The characters didn't really interest me too much. I think the main problem is, there really wasn't a story here. It's neat that Minor's incarceration may have been pivotal to the creation of the OED, but that alone couldn't sustain this narrative. All in all, though, I'm glad I read it. Learned a lot. Simon Winchester is NOT who you want to read if you're looking for academic nonfiction. He's got a great way of turning a nonfiction topic into a STORY, though, which I quite enjoy. Keep up the good posting, I love your blog! Jen- Hope you like it, now that you'll delve into it knowing what to expect! Man of la Books- It actually is kind of interesting. If you're interested in quirky Victorians you might like this. Dan- I'm going to have to agree with you on that. I definitely felt the narrative was faintly anti-climactic throughout. Kate- Yes, perhaps I should have done a bit more research into the book and author beforehand... I more or less picked this book out on a whim, merely because I recognized the title from somewhere. Helen- Sad thing is, I've never even seen a copy of the OED! Trisha- Oh yes, high expectations were definitely my problem. If only I could go into every book I read with incredibly low expectations, then I'd be pleasantly surprised all the time. I liked _The Professor and the Madman_, but I generally enjoy Winchester's style. He wrote another book, _The Meaning of Everything_, that was more about the history of the OED itself.